Brain Worm Farm: From Cars to Stars: A UFO Messiah Career Switch Guide. From Cars to Stars: A UFO Messiah Career Switch Guide. Cars, automobiles, steam horses, whatever they happen to be called, are all what Freudians would label as fetishes to some men; generally speaking of course. We may snigger at the simplistic analogy of the psychological inadequacy of a man's sexual organ and the corresponding superficial glitz of the car he drives and or covets. However, the amount of influence cars possess over their male drivers can lead to out of this world theologies. If your considering reinventing yourself, either because of a midlife crisis or to stave off the economic woes, then establishing a UFO religion from behind the wheel of your car might be your calling. Here follows two stellar examples of UFO Messiah career switches plus a nugget of weirdness for each. Raelism: Claude Maurice Marcel Vorilhon is a French born auto racing journalist and later test driver. Japanese business magnates funded a brief racing career for Vorilhon from 1999 through 2000. The impetus behind the deal was to generate publicity for the Raelism movement. 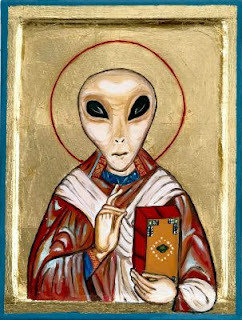 Vorilhon changed his name to Rael (supposedly meaning "messenger of the elohim") after he allegedly was visited by the extraterrestrial Yahweh in 1973. The alien visitation took place within a French volcanic crater between Vorilhon and one member of a group extraterrestrial scientists called Elohim. Rael was instructed to communicate to the world that these aliens had created life on Earth through DNA manipulation emanating from 25000 years of advanced intergalactic technology. Rael also preached of the return of the Elohim which prompted him to build them an Embassy anticipating their need to negotiate with the primitive peoples of Earth. Weird Fact: Due to the basal tenets of Raelism they have established a cloning research center at their head quarters and are apparently well funded. Aetherius Society: George King was born in Northern England just after World War 1. Although King worked a variety of jobs, like security keeping and a fire fighter during World War 2 in London, his time as a chauffeur and a taxi-driver are what caused him to make his career switch. King dabbled in the occult from an early age and eventually went on to become a Yogi, self-titled spiritual healer and UFO channeler. The Aetherius Society he founded in 1955 espoused a muddled doctrine of Yoga inspired spiritual teachings combined with the wisdom he garnered from his channeling with extraterrestrials. The philosophical contents of the Aetherius Society shared many of the same beliefs as the Theosophical movement, namely the belief that Mu, Lemuria and Atlantis were all highly advanced ancient civilizations with direct links to extraterrestrials of other dimensions. Weird Fact: George King asserts that he fought along side Martians as they defeated a race of marine aliens. These marine aliens, dubbed "Garouche", if not conquered, were hell bent to annihilate all terrestrial life on Earth in order to stake sole claim to Earth's oceans.